From the point when the team's six competitors climbed aboard the van to Philadelphia, there was no question what they were doing. The shared sense of focus and competitive tension permeated the white hunk of metal and it cruised up I-95. That mission, however, was not apparent to all observers. As the gaggle of GRC runners milled around the entrance to the Annanberg School for Communication's theater on the University of Pennsylvania's campus, an inquisitive woman opened the door. "What are you doing here?" she asked. "Are you here for the film festival?" They had business at Franklin Field. By midnight, three big PRs and a team record were in the books and the most successful track season in team history had its apex, in visceral images perhaps appropriately collected on celluloid but heart pounding in person. First, the ascendance of Drea Garvue. On the heels of 5k and 10 mile PRs in the last month, she set a 99-second PR in the 10k, running 35:46. After a 5:36 opening mile, she launched through a string of 85s, demonstrating to her parents and music teachers that metronomes were a waste of money. She split 17:42, just eight seconds slower than her 5k PR from a few weeks ago. She hit in 8k in 28:30 and fought through a late-race slump to close in 82. Her muscular frame punished the cool, but humid air that stood between her and the finish. 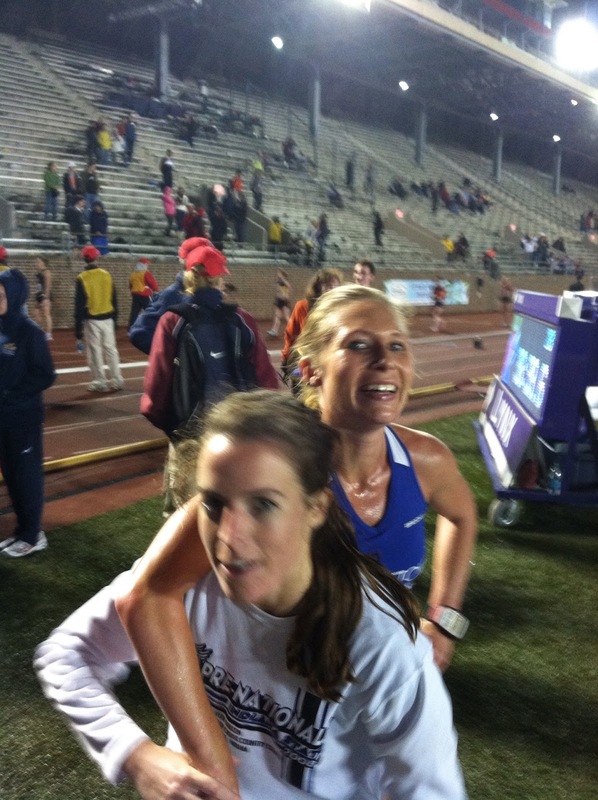 She finished between two Olympic Trials qualifiers in the marathon. "To run that hard for 5k, and still hang on and finish strong is a testament to Drea's toughness," said GRC Coach Jerry Alexander. "She has had a truly phenomenal season, and this race establishes that Drea is capable of competing on the highest levels. Drea is getting better every race, and there's every reason to think that trend will continue." She will continue her season in three weeks at the Rite Aid Cleveland Half Marathon. As Drea concluded her race, the rain took off and soaked the track as the men's 10k began. "Sam's here to party," Alexander remarked as Luff and Dave Burnham took the line. "$#(*@# those #@(&#)ers!" Charlie Ban yelled to him. Luff came into the race, planning to pass the time and cover the ground until it was time to go. Adopting strategies from sub-30 10k teammates Karl Dusen and Dirk DeHeer, he looked at the remaining distance as an opportunity. "I felt like I was holding back for the first half of the race, which meant that instead of thinking 'damn I have 5k to go,' I thought, 'OK, now I have 5k to catch as many guys as I can,'" Diddy said, his squishy footsteps still echoing throughout the stadium. The race started out slow, but when it accelerated and the vicious cockfight began, he kept his head on a swivel. He followed the splits, rather than the pack, and was happy to get to 5k easily on pace for his basic goal -- breaking 30-- which he did in 14:57, before tearing into a 3.1-mile kick that would launch him beyond his modest goals to a major achievement. "Sam was clearly in the best shape of his life, but his results so far this year were not indicative of his fitness," Alexander said. "But Sam knew that he was ready to pop a big one tonight, and he went in with a plan, and executed it to perfection." A succession of 70s and 71 led him to 27:23 with 800 to go. In the next 69 seconds, the rain reared its ugly head again, daring him to stare it down. With a 65-second final 400, he started through the deluge that was unable to extinguish the fire in his eyes. His time was a new club record, breaking his own from the year before, by 36 seconds. "That kind of huge breakthrough is the product of months and months of hard work, planning, and lessons learned in other races, and Sam put it all together in the biggest meet of the year," Alexander said. "I could not have been more pleased with Sam's performance. He has truly elevated himself to a whole new level, and he's going to build off that stellar race in the weeks and months to come. In the 5k, Ryan Witters ran a big PR of 14:40 in his outdoor debut at the distance. The pace was slow, and Witty was in contact with the leaders for 3k. At that point, the front of the pack made a move and Witty could not respond, but he hung on and fought hard through 4800 meters, where he came through in 14:10. The horse smelled the barn from there, and Witty finished with a sizzling 30 second last 200. 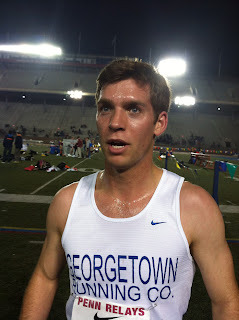 "Witty proved to himself tonight that he can compete with the big boys at 5k," Alexander said. "The speed is there, and when he develops the strength to go along with it, he can be be a factor in this race next year." Nobody who has run with him doubts he has a gas tank to finish those races fast. Maura Carroll ran a solid 17:34. "The pacing was uneven, and Maura struggled to find a rhythm, but the effort was there, and Maura will have better days. Her progress at 5k this spring has been excellent, and she will learn from this race and continue to improve," said Alexander. As great as the night was, GRC did not bat 1.000. Ryan Hanson struggled in the 5k, and was never comfortable despite the slow early pace. "Ryan was not himself out there tonight," Alexander said. "Bad races happen to everyone, but this is no way indicative of Ryan's fitness, and he will bounce back and run strong the rest of the season." Dave Burnham's return to the track did not go as he planned, and he dropped out of the 10k after 17 laps. Dave was competitive, going through 4 miles in 19:48, but he was struggling to the point that he could not contiune. "Dave has worked himself back into racing shape, and he will be back. Dave has too much talent to stay down for long," said Alexander. Sam Luff - 29:37! PR!! NEW GRC RECORD! Drea Garvue - 35:46! PR!! Ryan Witters - 14:40! PR!! congrats Sam, well deserved and based on your 5ks, it was only a matter of time! I'm telling you, Sam Luff carries a big stick.